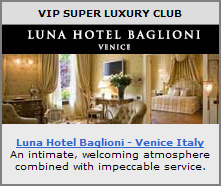 Book your online reservation directly with top hotels in Venice Italy - from two star, economy, budget, child & family friendly lodging, first class accommodations to superior hoteles, deluxe luxury hotels and resorts. Find downtown Venice hotels, midtown, business district or airport hotels using our search engine, and find the best hotels in the Venice area for your next family vacation, romantic weekend getaways, holiday, or business trip. Ideally positioned a stone's throw from Piazza San Marco, right in the heart of Venice facing the San Marco Basin and the island of San Giorgio, the Luna Hotel Baglioni is situated a short distance from the most famous historical and artistic attractions of the city. This historic Venetian hotel, member of the Leading Hotels of the World and Fine Hotels & Resorts, is housed in a magnificent, aristocratic Venetian palace and offers its guests an intimate, welcoming atmosphere combined with impeccable service. Open in February 2006 it is a modern structure in steel and crystal, situated in the heart of the most important shopping center of the province of Venice, close to Gaggio Porta Est railway station (only 400 mt, 5 minutes walking) with departures every hour and in a strategic position for the access to the lagoon town and to the main highways. The bold architectural style arose from the desire to decline in contemporary shapes colors and materials of the Venetian tradition. An imposing hall, 3 floors high, welcomes the customer in an elegant atmosphere that involves and charms him from the first moment. The Boscolo Venezia is a 5-Star Luxury Hotel housed in the historic and prestigious Palazzo Rizzo Patarol, formerly the French and Savoyan embassies. The 18th-century luxury of its precious marbles, splendid period frescoes and majestic chandeliers make the Boscolo Venezia the ideal place to immerse yourself in the magical atmosphere of this unique city. The hotel is the only one in Venice to vaunt a vast internal garden evocatively overlooking the lagoon, perfectly conserved in all its historical detail. The location of the Boscolo Venezia, close to the centre but removed from the most crowded streets, lends a sense of peace to the city's multifaceted charm. All the elegance and efficiency of a modern hotel with spacious and elegant rooms and magnificent lagoon views. The property is in a strategic position both for leisure and business. Just three minutes from Marco Polo Airport, ten minutes from the centre of Venice and 4 from San Giuliano Park in Mestre. The hotel has 114 large rooms with comfortable French beds, free wi-fi internet, satellite-TV, minibar and the highest levels of service for all the comforts of a relaxing holiday. It also has a large and excellent restaurant which can seat 200 people. There are also two meeting rooms, a day-office for small meetings and an auditorium with 100 seats. The Boscolo luxury Hotel Bellini is situated in an elegant 18th-century patrician palazzo in the Cannareggio quarter, transformed into an hotel at the turn of the last century. Inside, the luxurious splendour of the 18th and 19th centuries lives on in the ancient marbles and Murano glass chandeliers, all set against rich period decor. Easy to reach and overlooking the Grand Canal, the 4 star Hotel Bellini is just a few minutes' walk from Saint Mark's Square, the heart of the city, in an area abounding in shops and restaurants. A noble beginning of the Fifteenth century building, located in a very pleasant area of Venice, a short distance from piazzale Roma, the University, Chiesa dei Frari church, campo Santa Margherita and from the Gallerie dell'Accademia, Hotel Al Sole welcomes you amongst typical Venetian atmospheres and modern comforts. Delightful indoor garden, a real privilege for a hotel in Venice, classic, superior and junior suite rooms, make Hotel Al Sole one of the most pleasant 3 star hotels in Venice. Hotel da Gigi is a welcoming hotel located close to the A4 Venezia - Trieste motorway, just 200 meters away from the Santo Stino di Livenza exit, within easy reach of Venice and the most important attractions in the area. The hotel has 30 rooms, a restaurant and ample parking with independent toilets and showers for lorry drivers and travelers. Another important feature of the hotel is its accessibility for the disabled. The restaurant serves both local specialities and international dishes. Enioy the advantages of an intimate hotel on the VeniceLido with its famous beaches,just a short ride by waterbus to the heart of the city,only 10 minutes far from San Marco Square.Perfect for holidays on the sea,Business trips, Congresses and to enjoy the 'International Film Festival. The Hotel is the ideal starting point to visit the fashinating Venice and the famous islands of Murano Burano and Torcello. Elegant and Charming Villa refurbished in 2002 according the Bio Architecture concept requirements. Excellent location at only 150 meters from boat station heading to SAN MARCO SQUARE. Quiet, Romantic , Elegant Villa . Rich Buffet breakfasts with choice of organic products, during the summer served by the garden. 2 Star Hotel in Venice. Located in Lido di Venezia 10 minutes by boat from/to Saint Mark's Square. 300 meters from the main boat station and shuttle boat to/from Venice Airport. Next to the main Venetian Congress. / Meeting area and Casino Palace. Most reasonably priced Hotel amoung the Venetian 2 Stars Hotels. Please Note: RATES DOESN'T INCLUDE BREAKFAST. The Hotel Le Boulevard was built in 1985 from a year's '30 old building and fully renewed in 1996. The central position of the Hotel (only 10 minutes by public waterbus from St. Mark's Square) allows you to explore all the advantages of a double holiday: in the old historic Venice and in the residential, relaxing beach resort area of Venice. All (45) rooms are furnished in a elegant, comfortable and warm style and are equipped with: air conditioning, minibar, radio, satellite TV, safety box, telephone. Also available are a bar with terrace, reading hall, congress/banquets hall, internet access point, private carpark. The Hotel Le Boulevard is easily reacheable by public or private waterbus from the main highway/railway/airport terminals. The hotel Ambasciata is a brand new Hotel situated 250 meters from the railway station of Venice-Mestre and guarantees an immediate holiday in Venice in just 10 minutes and 24 hours a day. It offers night's passing and buffet breakfast in 20 wides rooms with individual air conditioned, individual heat, frigo bar, satellite tv, internet access, bath with shower or bathtub to choice, free car park and a reception active for 24 hours a day.